Sometimes, I forget that my husband hasn’t been with me forever. We joke about it all the time; he forgot that I hadn’t been with him in Latvia forever when I was living in Liepāja with him. In this case, we were at our favorite grocery store who had a sale on pumpkin bread. He’d never heard of it before, much less tried it, which I immediately promised to rectify. 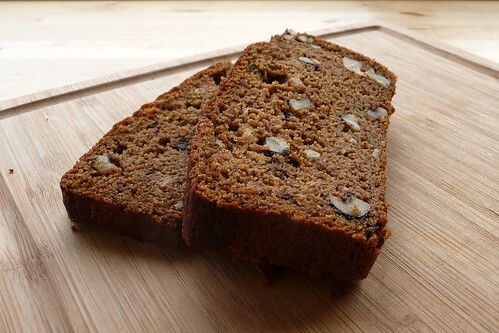 Pumpkin bread, like its cousins zucchini bread and banana bread, is extremely popular here in Utah. I remember when our neighbor across the street from the house I lived in as a kid brought over zucchini bread shortly after we moved in from California. Mrs. Webb had zucchini plants and anyone who has ever tried growing zucchini knows what I mean when I say the damn plant grows like a weed. So, she made zucchini loaves for the whole neighborhood several times just to put a dent in the supply. I thought it was great and proceeded to snack on it every chance I had. The trick was coming up with a recipe that wasn’t too sweet. 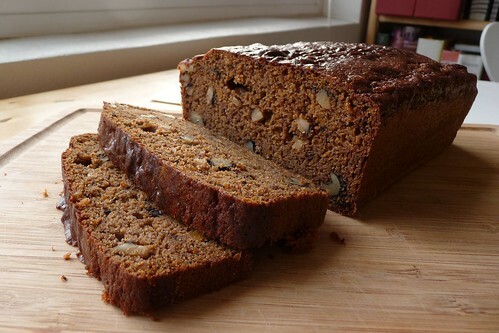 Many pumpkin breads and banana breads suffer from being tooth-rottingly sweet – I’ve seen recipes call for 3 cups or more of sugar for ONE LOAF. Way, way too sweet. And believe me, if it’s too sweet for me, my husband won’t make it through a bite. Since he’s Latvian, he grew up loving sour foods, not sweet. Most of the commercial and restaurant desserts in America that he’s tried are simply too sweet for him. As for why I used a white sugar + molasses combo: this is how you substitute white sugar for brown when you run out unexpectedly! However, due to the beautiful color of the crust and crumb, I’m not sure I would use the brown sugar. I like the molasses’ effect on the bread too much. Cream together butter and sugar. Add eggs. Beat until light and fluffy. Mix in pumpkin, sour cream and spices. Whisk together flour, baking soda and salt. Add gradually until thoroughly combined. Stir in walnuts. Pour into a greased and floured loaf pan and bake for 50 – 55 minutes. A toothpick inserted in the center should come out clean when finished. Cool in the pan for 5 – 10 minutes, then turn out onto a wire rack. Cool completely before slicing. If using mini-bundt pans or mini-loaf pans, adjust baking time to about 35 – 45 minutes. This entry was posted in bread, recipes, untranslated, vegetarian. Bookmark the permalink.